All business is due the Thursday before a meeting, and financial requests take up to two weeks to process after a meeting, so groups are encouraged to submit requests as soon as possible. 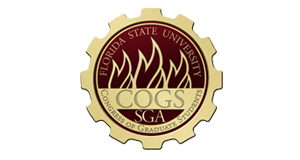 The Congress of Graduate Students (COGS) is the official representative body of graduate students at Florida State University. This includes all post-baccalaureate, special, masters, specialist, professional, and doctoral students. In accordance to the Student Body Constitution, COGS is the part of student government dedicated to graduate students. As the body representing graduate students, COGS represents graduate student interests to the university aCnd community, and is empowered to issue resolutions expressing the views of graduate students and calling attention to important issues. The Congress provides graduate students with grants for conference travel, and funds programs and activities across campus that are targeted at graduate students. Additionally, the Congress is a funding source for graduate student organizations. This is made possible by the Activities and Service (A&S) fees paid by students. Each year, COGS receives several hundred thousand dollars in funds directly from a portion of the A&S fees paid by graduate students to FSU. COGS has full authority in the oversight, regulation, and allocation of these funds to graduate students, graduate student organizations, and other programs at Florida State University. COGS has the responsibility to use these funds for the benefit of the student body. The COGS assembly is comprised of elected representatives from all 15 colleges and schools at the Florida State University. COGS is led by an elected Speaker who is supported by an Executive Board comprised of an elected Deputy Speaker for Finance, Deputy Speaker for Judicial Affairs and Deputy Speaker for Communication. The Speaker is the official representative of all graduate students to the university and community, and coordinates all administrative work necessary for the efficient operation of the Congress. The Deputy Speaker for Finance, along with the Speaker, oversees the financial decisions and expenditures of fund, and is second in line to the Speaker and assumes all of the Speaker’s responsibilities in his/her absence. The Deputy Speaker for Judicial Affairs and the Deputy Speaker for Communication assist in the administration and activities of the Congress. COGS representatives and officers are elected to a one-year terms in the fall semester. Representatives are elected by the vote of graduate students in their respective constituencies (college, school, or graduate students as whole) during student government elections. Vacancies are filled by petition throughout the year. Executive officers are elected by the COGS representatives at the first meeting of the Congress, and upon vacancies.